Chicken Wiggle is Atooi's second game since studio head Jools Watsham started it last year and, at a first glance, the game's core is a lot like Watsham's biggest claim to fame: Mutant Mudds. It's a platformer, the visuals are retro-inspired and 16-bit, and you make your way to the goal while dodging/defeating enemies and nabbing 100 collectibles and other hidden objects along the way. But a deeper dive reveals something much more; so much so that this could be Jools Watsham's and Atooi's best game yet. The story begins with the titular chicken setting out to rescue his fellow fowl friends, who have all been captured by a witch on a pogo stick and whisked away into the sky. And, recognizing that chickens can't fly (at least not normally; more on this later), Chicken immediately spots and teams up with a nearby worm named Wiggle. 'FRIENDSHIP!' the game exclaims; a rather endearing sentiment, and the first of a few aspects to indicate this title is focused on positivity. Right after, you're immediately introduced to the game's core mechanic: using Wiggle as a sort of hookshot/whip to pull you toward walls and ceilings. Additionally, you can whip enemies with the worm to stop and simultaneously stun them, then subsequently peck them with Chicken to defeat them. One minor gripe about this is it feels like you need to get a little too close to enemies to peck them for the game to register it. On many occasions, an enemy would end up taking out poor Chicken because I was trying to get close enough to peck it, which was a little frustrating. In any event, the hookshot mechanic isn't necessarily groundbreaking since games like Bionic Commando originally pioneered it and it's been a staple of Zelda games over the years, but Chicken Wiggle manages to combine it with a variety of different abilities and level designs to make something pretty memorable in the end. Each in-game world is a tower based on a different theme, with one ghost level in each bunch (carrying on the ghost theme inspiration from Mutant Mudds Deluxe). Whereas I felt that some of the level design in Mutant Mudds began to feel a little bit samey, Chicken Wiggle does a great job of varying the design by introducing new mechanics and obstacles frequently. For example, in one level you'll have to navigate your way around certain enemies and their movement patterns, or figure out how to defeat them before proceeding, while in the next you'll have to deal with traversing a gel-like substance that's suspended in air around spikes. As mentioned earlier, there are also special abilities for the chicken that make the game a lot more interesting, including a superhero suit that allows the chicken to fly, a jetpack that enables a double jump, a hot air balloon that allows movement in any direction for a limited number of spaces, an ability that turns the chicken ghostly and enables it to walk through spikes and attack ghosts, and even a hard hat that allows it to peck through just about any wall. The latter especially changes up the game, giving you a lot of leeway to essentially find your own path through the level. What also gives Chicken Wiggle amazing lasting appeal is the ability to create and share your own levels, effectively giving it a Super Mario Maker vibe. 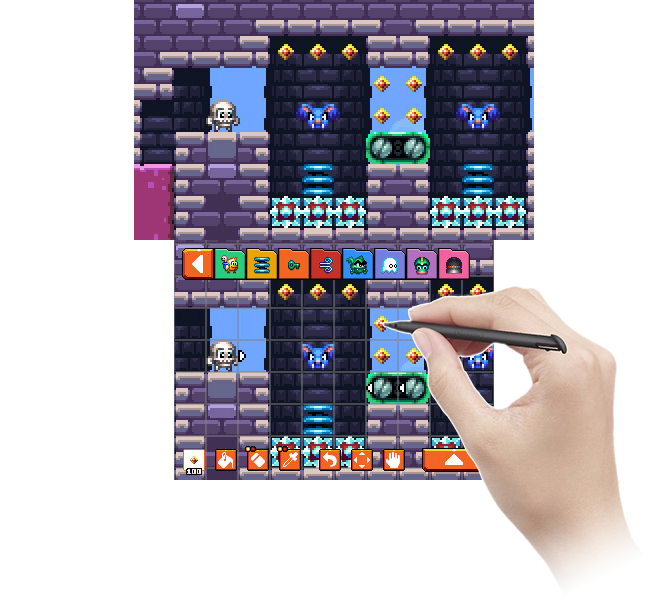 As the game continues to live on, you'll get access to potentially hundreds or thousands of user-created levels, giving the game an incredible scope of content to play through, even if creating levels isn't your thing. 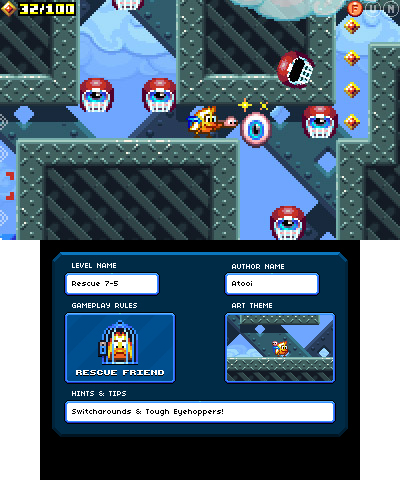 If you do enjoy designing levels, however, Chicken Wiggle offers a robust level creator for you to play around with, giving you access to all the game's assets to use however you see fit. Also pretty nifty is the option to change the level objective from rescuing your friend to grabbing all the loot, beating all of the enemies, destroying blocks, and more. It must also be said that the soundtrack in Chicken Wiggle is fantastic and easily one of the best in Atooi's library of games to date. Matthew Gambrel's music is evocative of older mascot platformers such as Mickey's Magical Quest, and fits the whimsical world of Chicken Wiggle extremely well. From a ghost level theme with marimba/balafon beats to a hot air balloon theme with retro NES vibes, there's a lot of variety to love here. Chicken Wiggle makes a strong case for being Atooi's best game yet; Jools Watsham has touched on something extremely special here with its combination of a charming mascot duo, hookshot platforming, and a fully-fledged level creation suite. All this and more add up to a great package that's well worth the price in the end. 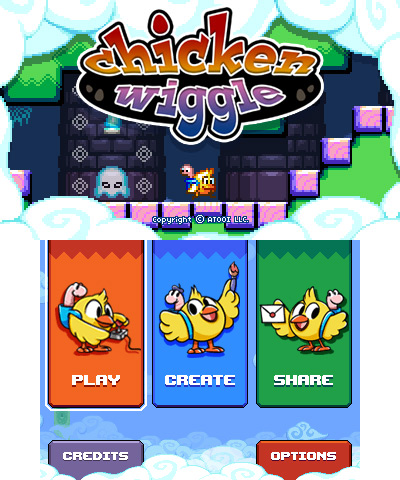 If you enjoy mascot platformers, retro games, and/or designing and sharing your own levels, Chicken Wiggle is a must-buy. - Pecking enemies can be hit-or-miss due to how close you have to get to them, causing this to be the most common (and needless) cause of death in the game. Chicken Wiggle is another great addition to Atooi's stable of excellent retro-inspired platformers, and makes a real case for being the best of the bunch thanks to its added level creation and sharing capabilities.